Hi there, just to share about my adventure... I dropped by during lunch break on Friday 13th September (Oooo... Friday the 13th) to check out guqin at GTAR Enterprise. Bras Basah Complex Blk 231 Bain Street #03-55 Singapore 180231 email: gtar_ttt@hotmail.com There were only 2 guqin resting against the wall. I test played them. One (the left guqin in picture, a ZhongNi shaped guqin was in the blue bag) was about SGD$4000+(the sales rep could not quote me exact figure even after making a phone call to ask the 'warehouse') it was not so audible and was harder to play. Shan wood. The other was SGD$880 Tong wood (right guqin in picture) It was louder and easier to play, as it required less strength to pluck the strings to project the sound. Maybe I'm a beginner, that's why. Haha. Faux leather guqin carrying case costs extra $$. It seems that they do not have any hard foam guqin cases. 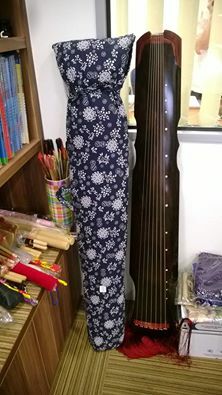 Guqin lessons are available at SGD$200 for 4 lessons per month, 45 minutes per lesson. I was told they have more guqins "in the warehouse." GTAR Enterprise is closed every Thursday.